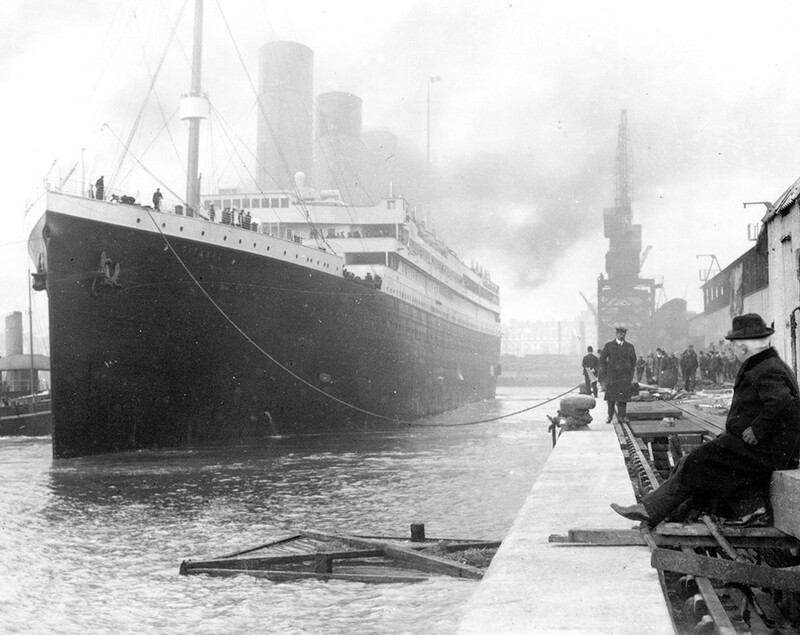 The RMS Titanic prior to her 1912 maiden voyage. What is it about the story of the RMS Titanic that continues to captivate audiences? It's not as if we don't know the story by now; the construction of its massive hull, supposedly impervious to the perils of the sea. We have seen image after opulent image of upper-class accommodations — the grand staircase, the dining rooms, the gymnasium and pool — populated by numerous prominent members of high society. And, of course, we know that when the Titanic hit an iceberg on the morning of April 15, 1912 en route from England to America, more than half the 2,208 passengers died as the ship inevitably sank into the sea. Since then, our fascination with the wreck has endured, fueled by the underwater rediscovery of the wreck in 1985 and reinterpreted through literature, art and film, including the 1997 blockbuster movie starring Leonardo DiCaprio and Kate Winslet as star-crossed lovers. It's also been memorialized in exhibitions, including Premier Exhibitions' Titanic: The Artifact Exhibition, which runs from October 2017 through May 2018 at the Northwest Museum of Arts & Culture (MAC). The exhibit, according to Carol Summers, the MAC's director of marketing and communications, recreates the Titanic experience through artifacts, photographs and narrative elements. "The creator of the exhibit does a really good job in making you feel like you're there," says Summers. When you enter the exhibit, for example, you receive a boarding pass with a name of a passenger, ranging from a clergyman to a crew member to real estate and Waldorf-Astoria Hotel founder John Jacob Astor IV. It isn't until the end of the exhibit, when you encounter the Memorial Wall, that would know whether or not the person whose name is on your boarding pass survived. Moving through the exhibit, you learn about not only the origin of the ship, but also its rediscovery off the coast of Newfoundland, perched on the ocean floor nearly 2½ miles down. It was estimated to cost around $7.5 million ($166 million in today's economy) and took more than two years to build. At 882 feet long, it was 100 feet longer than its famous rivals, the Mauretania and Lusitania, both built by Cunard. With such dimensions, the exhibition only skims the surface of life on board the massive ship, displaying nearly 100 out of the 5,500 artifacts retrieved from the wreck over the years. Included are items reflecting shipboard operations and day-to-day life for passengers, including cabin accommodations. Third-class cabins, for example, were little more than bunkrooms, while first-class cabins were spacious, lavishly outfitted in rich, dark fabrics and heavy furniture typical of the time period. It's the same time period, says Summers, in which Spokane's Davenport Hotel was built, which the museum team has capitalized on in order to connect with Spokane's turn-of-the-century history. They're also hoping to share the story of a Spokane-based Titanic survivor, bringing the epic saga of the ill-fated ocean liner even closer to home port.